IMF chief Christine Lagarde’s claim that Britain’s economic growth is inclusive, sustainable and a positive model for struggling European states has been dismissed as inaccurate by experts. In what may have been a strategically-timed gift in advance of May’s general election, Lagarde praised Chancellor George Osborne’s path to economic recovery as a positive model for debt-laden EU states. During talks at the IMF’s offices in Washington on Thursday, Lagarde said Britain’s economic progress was “exactly the sort of result” she wanted to see. The IMF chief, who previously held the position of France’s finance minister, said Osborne’s economic policies had set a positive example for European policy makers. In a glowing endorsement of the coalition’s austerity agenda, Lagarde paid homage to Britain’s reduced deficit, bolstered growth and reduced unemployment. But UK economist Michael Burke dismissed her remarks as misguided. He warned Britain's current phase of economic growth is not sustainable. “Whereas the EU has stagnation, Britain will have 'boom' followed by bust,” Burke, a former Citibank economist, told RT. Lagarde’s praise of Britain’s path to recovery contrasts sharply with previous IMF criticism of the government’s economic policies. In 2013, the body warned a continued path of punitive austerity risked derailing the UK’s economic recovery. His comments angered senior Conservatives and Liberal Democrats. When Britain’s economy began to experience growth shortly after, however, Lagarde said the IMF’s predictions had been inaccurate. Lagarde was in Washington on Thursday discussing the global economy with senior figures from varying countries. In a climate of economic stagnation, she said only a few states are “driving growth.” Lagarde referred to progress by the US and Britain as particularly noteworthy. Economic growth is solid in the US, with 2015 shaping up to be “a good year,” she claimed. She said the UK’s recovery is characterized by inclusiveness and sustainability, and Britain’s “eloquent and convincing” route out of crisis has set a positive example internationally. Burke, however, strongly rejects her suggestion the UK's economic model should be imitated elsewhere. He argues the coalition’s austerity cocktail of “cuts to government spending,” and lowered wages, along with measures to inflate consumption, have not produced inclusive growth in Britain. Rather, people in the UK must contend with “greater poverty, falling real wages and sharply deteriorating public services, such as NHS and schools,” he said. Speaking in Washington, PM David Cameron expressed delight at Lagarde’s appraisal of Britain’s economic progress. “I was delighted by what Christine Lagarde said and I thought it was strong testament to the fact that the British economy is recovering strongly,” he said. 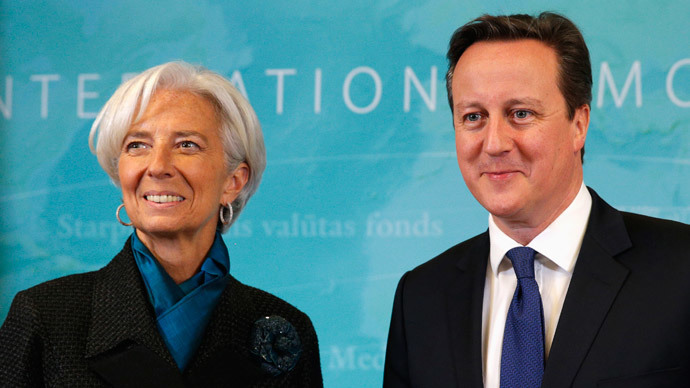 Cameron added he thought Lagarde’s endorsement would strengthen the government’s leverage to “set the agenda” on international trade agreements, and structural reforms. The UK’s Shadow Chancellor, Labour’s Ed Balls, was also in Washington on Thursday for the launch of a special report on inclusive economic prosperity. Balls strongly refuted Lagarde’s comments on Britain's economic progress. He stressed that recent economic history indicates that economic growth and increased living standards do not always go hand in hand. “The challenge is about productivity and wages. That is where the solution has got to come,” he said. Burke’s prognosis is more sober. He says economic growth in Britain is anything but inclusive. “The beneficiaries are landlords owning two or more homes, who benefit from rising house prices – as well as shareholders from all the subsidies offered to industry and anyone getting a share of record City bonuses,” he told RT. He stresses the boom-bust cycle that currently characterizes Britain’s economy will not end well. “There is growing household debt, which is encouraged by the government to fuel the housing bubble via schemes like 'Help to Buy',” he said.